My lovely friend Allyson sent me a selection of Wet n’ Wild palettes from across the pond and I’m working my way through them slowly. Some of the colour combinations are frightening for a neutral-loving lady like me but they’re all pretty damn fantastic nonetheless and I’m enjoying breaking my safe boundaries! Considering we can’t get these in the UK, I thought I’d work my way through the palettes and torture you a little with some photos of their goodness. how hot is that blue? Poor blue, I haven’t done it justice AT ALL! Do you own any of these Wet n’ Wild Color Icon palettes? I have a few my favourite is the Wet ‘n’ wild comfort zone 8 pan palette (I have a couple) the colours are beautiful and they are so soft and blendable I LOVE them. They don’t compare with the wet ‘n’ wild we get in the UK. You look fab in bolder colours! I remember when Boots had a Wet n Wild stand…I only saw it once though :/ Managed to grab an eyeliner before it disappeared! I think you look lovely in these colours! You make a budget palette look posh! I don’t own any of these palettes because we don’t really have access to the brand in Australia. I have seen a few blogs talk about these but your post has officially made me add it to my US shopping list for when I head there next month. Thank you for making me spend more money hahaha. Hi, I’ve read your blog for a while now but have never commented.. I just had to break my silence tell you how much I love this look though, it’s so pretty on you! My sister is going to America in a few weeks, I’m going to give her a big list of things to bring back and this will definitely be on it Such a shame we can’t get Wet n Wild here! Oooh, lovely look! You *must* get hold of Comfort Zone, it’s a fabulous neutral palette! I also love the Lust and Cool as a Cucumber palettes. I wish we could get hold of these easier in the UK ‘cos I’m addicted. How do you manage to make budget make up look like it’s worth gold?! 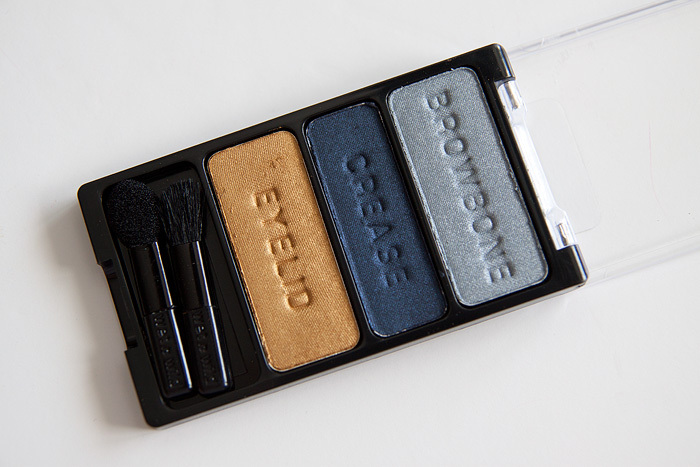 That shimmery light blue on the brow bone? They mad? Man, I have wanted one of those trios for ages now (the one that looks like neopolitan ice cream…nom). Wow…what a stunning look! I didn’t know the blue-silver highlight looks so good. I’ve tried to create a similar look with colours I already own, and I’ll definitely try it again. I have the Cool as a Cucumber and Greed palettes that I got from ebay after drooling over Christine’s swatches on Temptalia for weeks. I have Silent Treatment. Love it. It’s my go to look. Feel a bit bereaved cos my daughter borrowed it and has spent the night away from home. 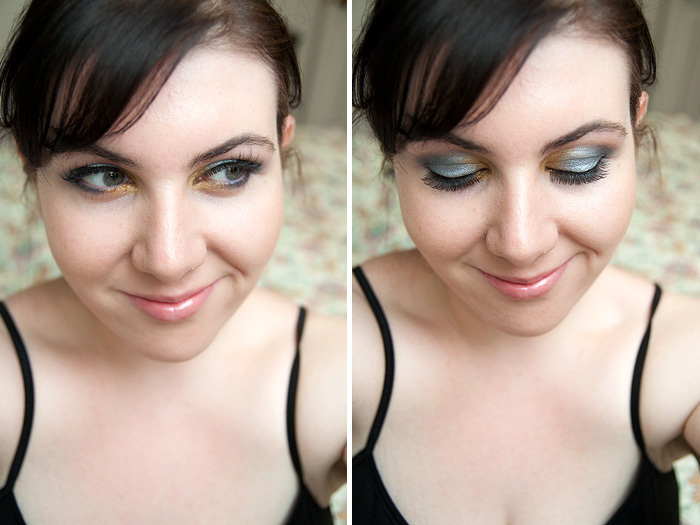 Wet n Wild may be a budget brand but their eyeshadows rock! I’ve been meaning to pick up some of the blushes too, since I’ve heard those are very good too. I just bought the 8 pan palette in pedal pusher and I’m so excited to review it! All the posts on these palettes have been so positive! You did a great job with these. I wasn’t sure how the orange/gold would integrate but you did a beautiful job. The colours look horrid together in the pan, yet somehow you have made them work and made me want to join you in wearing it! Look at you, Skinny Minnie! Holy frak I NEED this palette, I think I’d just do the gold on the lid and dark blue in the crease and wear that combo for days! I haven’t tried any of these palettes, but as soon as I saw this (and your amazing application of it), I knew I had to have it. Thankfully I found it at Rite Aid, and for only US$1.99!! Can’t wait to try it out- hope it looks at least half as good on me as it does on you. 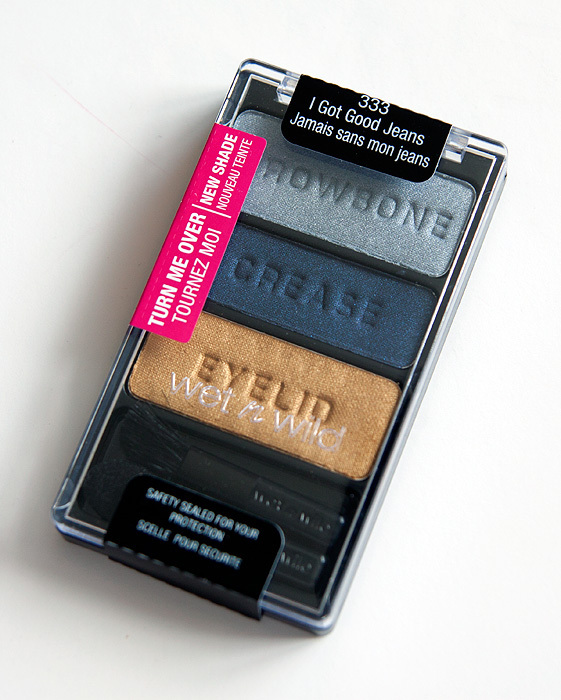 Love the name of this palette in French: “Never Without My Jeans.” Can’t that’s true for me but the colors are gorgeous. 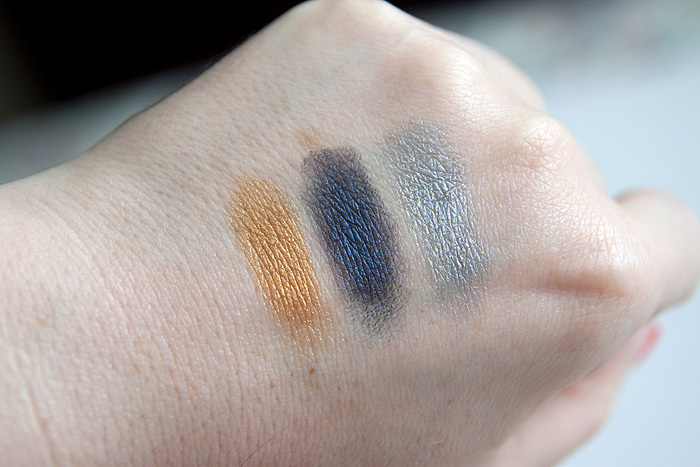 Are they dupes for any eyeshadows out there? Probably from MAC or Urban Decay?